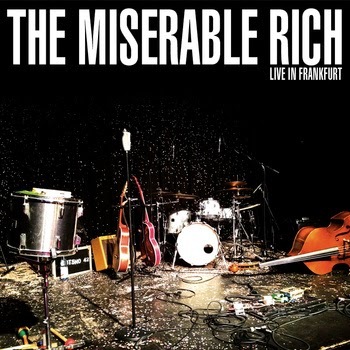 The Miserable Rich are back with a double album - a live album recorded in Frankfurt on their 2012 tour and an album of cover versions recorded over the past six years. Hopefully this and their recent short tour of Germany and Austria are a precursor to them getting back in the studio and on the road. Live In Frankfurt is a ten-track CD recorded on their farewell tour in 2012. Germany always had a special place in his heart for the baroque pop of the Miserable Rich, giving them bigger crowds when they toured than in their native UK. It was therefore fitting that this record of their powerful live show was recorded there. The record features their final line-up and covers their entire career with four songs from their debut Twelve Ways To Count, two from follow-up Of Flight And Fury, three from their final (to date) album Miss You In The Days and a solitary b-side For Heaven’s Sake, demonstrating they were a band that, despite some line up changes, delivered a remarkably consistent quality of material across the four and a half years they were with us. Front man James De Malplaquet’s vocals tell the stories of debauchery and love lost of the first two records and the ghost tales of Miss You In The Days with a tone and enunciation that wrings every little bit of depth and emotion out of them. It feels he’s lived through the songs – the declaration of love of the almost-waltz of Monkey, the accapella optimism of For Heaven’s Sake, the relationship break-up of Let Me Fade and the drinking and disaster tales of the last two songs Pisshead and Hungover as well as the darker tale of harder substances and honest self-assessment of Chestnut Sunday. The live set up allows the band to shine. Despite there being six of them on stage, the sound here feels incredibly sparse, every note there by necessity and not through any attempt to show off and this adds to the haunting feel of this record. The strings add to the drama of the songs as they build – the love-struck tension of Monkey, the sign-of-the-times social commentary of Ringing The Changes set perfectly to the dramatic arrangements of the song. Part of the reason for the dissolution was that Mumford and Sons called and took Will and Mike out on tour with them as backing musicians and whatever you think of the public schoolboy farming collective, they’re not going to take any old musician out on tour with them. They’re not afraid to let go either as evidenced as Chestnut Sunday rip-roars to its string-drenched conclusion, dueling violins and cellos in a race for the finish line. The final two songs are, as Miserable Rich tradition dictates, played out in the audience. There’s ribauld laughter as the Germans join in with the chorus of Pisshead. It’s at this moment that they make an unmistakeable connection that everyone can relate to and which their recorded output doesn’t do justice to – “I feel much better if I have a drink, talking about it makes me start to think, thinking about it makes me want to drink” before the band pick up the pace, drowning out James as he (in all likelihood) quaffs a red wine or fine whisky and clinks glasses with the crowd. Before the final song, ironically called Hungover, we get him engaging with the crowd, one of the real beautiful moments of any Miserable Rich show and sadly missing from the rest of the CD, complimenting the audience, joking about covering a German song about a dead tree whilst one of the band requests more whisky. There was always a fun element to a Miserable Rich live show as well as the intuitive, brilliant musicianship and songs that this CD reveals. The second disc is entitled All The Covers although it does miss their gritty take on Dylan’s Subterranean Homesick Blues recorded to kick-start their Pledge campaign for Miss You In The Days. They take on a wide range of artists within the eleven songs – classics such as Orbison (Sunset), The Stranglers (Golden Brown), Eurythmics (Sweet Dreams) and Cohen (The Stranger Song), off-kilter choices such as Kylie (All The Lovers), James (Hey Ma), Pixies (Gigantic), Iggy Pop (Shades) and Hot Chip (Over and Over), label mates at Willkommen The Leisure Society (Come To Your Senses) and last year’s Christmas double A-side Jona Lewie’s Stop The Cavalry. It represents their predilection for throwing a cover into their live set – Hot Chip’s Over and Over was a regular feature in their live set and appeared as an early b-side, whilst the Eurythmics, Pixies, Iggy and Stranglers covers also featured in their early sets as well as on a cd-r they sold at gigs around that time. The James and Kylie songs come from their Miss You In The Days pledge campaign, whilst The Stranger Song came from a magazine cover-mounted cd of Cohen covers where they got their song simply because they were the last to choose. What they do is make each of the songs their own to different extents. Over And Over strips away the dance elements and replaces them with strings and James' voice adds a little more menace to proceedings. Whilst their take on Cohen’s Stranger Song is a fairly straight one it also packs all the emotion and power of the original, whilst Kylie’s All My Lovers is transformed from a disco classic into a chamber pop slab of genius reinterpretation, faithful to the gleeful abandon of love of the original, but also sounding like it could be one of their songs. Orbison’s Sunset is string-laden and dramatic in the opening verse, a contrast to the racing beat of the chorus and subsequent verse and de Malplaquet adds his own vocal interpretation to it as he does with many of the covers on here. The cover of Pixies’ Gigantic replaces the drums and guitar with strings that create the same drama and atmosphere as the original but without some of the menace in Kim Deal's voice, it being replaced with an air of celebration of the big big love. The strident bold tones of James (the band)'s Hey Ma are transformed into something more reflective and mournful without reducing the impact of the “Hey ma, the boys in bodybags are coming home in bodybags” punchline of the chorus. The cover of Iggy Pop's Shades cuts the six minutes of the original down to less than four, which is a good move as it's a song that goes on too long and the cover strips away all its commercial sheen and is all the better for it - it's rare that covers surpass the original, but there's a few instances of it on this record. Another song stripped back to strings and without that pop veneer of the original is the cover of Eurythmics' Sweet Dreams and this gives the band the chance to show how their vocal harmonies can lift a song before it fades to an acapella repetition of the chorus. Of all the covers Golden Brown and the Come To Your Senses are probably the most similar to the original, both in terms of the musical arrangements and the vocals without sounding like a carbon copy, not surprising on the latter given the crossover in band membership. This is a welcome addition to the Miserable Rich catalogue, a record capturing their mix of fragile strings, drunken charm, mischievous lyricism and the power they create in the live environment on disc 1 and a collection of how their musical brains can reassess and reinterpret other people's music on disc 2. All we need now is the comeback. The album can be purchased from their Bandcamp site.